Hello everyone, hope your all having a great weekend. Today’s post is going to be fairly long as I have a lot of make up, or well at least I think I do, I’m often told I need to stop but I can’t I really am addicted! haha. So before I ramble my fluffy socks off I shall begin.. This is all my make up, beauty and nail products. I store it in 4 different sized plastic draws. Sorry for the very glamorous numbers I had to add I just thought it would make it easier to show you what’s in what draw. So in number order.. This is where I store my brushes, make up books and eyelash tint. I have about 30 brushes mostly Coastal Scents and only 1 Mac brush. The book shown is Colour Me Beautiful: Make-Up Manual available here. The eyelash and eyebrow tinting kit I have is from my beauty therapy course which I never used as you probably all know I’m not doing anymore. This is the draw I like to call ‘The Random Draw’ so creative aren’t I? As you can tell by the name, anything and everything is stored in here including, mixing palette, sponges, No 7 primer, eyelash curlers, Barry M catalogue, Benefit mini’s, samles and brow products. Just to name a few. This is where the fun starts. This is my foundation/concealer/powder draw. 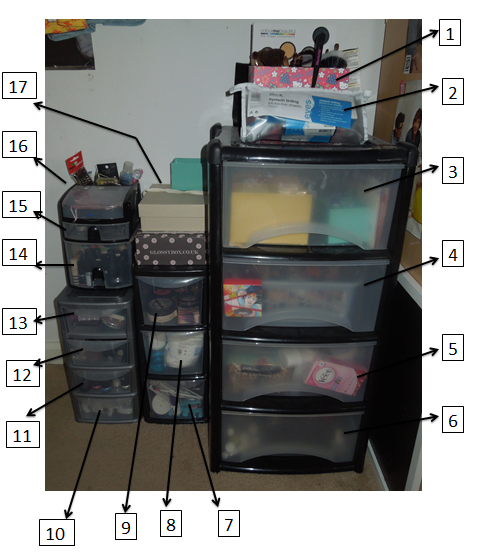 I also keep some of my small make up bags in the back of this draw as you can kind of see in the picture. I will hopefully be doing a more in depth post on each of the draws ans what’s in them. This is my beauty products draw, it’s full of fake tan, body scrub, waxing strips, Lush bath bombs, moisturiser, toothpaste and everything in between haha. This is one of my favourite draws. It’s my nail art and false nail draw. I keep false nails, gems, 3D nail bows, nail stickers and everything you would ever need to decorate your nails with. This is my skincare draw where I store my face wash, make up removers, spot creams etc. This is my blush/bronzer draw. SBC is just a brand of make up I got with my college kit. As I’m not doing the course I thought why not use the make up myself? haha. This is my fake eye lash draw, as you can tell I absolutely love fake eyelash’s, I have loads of different ones from thick to thin whatever the occasion I have a pair ready. This is my single eye shadows, dazzle dusts, eye tattoos and glitter. I love using glitter on my eyes but I always seem to end up with it all over my face, damn. No high end mascaras here, only L’oreal, Maybelline, Bourjois and other brands from Boots. Oh actually there is a high end sample of Benefit’s Bad Gal sample from a magazine. This is my palette draw, my favourites are the Naked Palette and MUA Poptastic. This is my lip draw, lip scrubs, lipsticks, lipgloss, lip stain, lip balm. Wow that’s a lot of use of the word ‘lip’. Eyeliners, in a range of different colours. This is where I keep random things like hand gel, mirrors, pins, hair grips and lots of other random things. These are a couple of my GlossyBox’s and a random spare box to put my make up in. Well woow that was a long post! Hope you’ve all enjoyed a little look into my make up and beauty collection, I’ll do more in detail posts on each draw so you can see what products I have.